Brighton Ladies midfielder Dani Buet feels the team are learning all the time as they prepare to play in the Women’s Super League next season. Buet joined the Seagulls last summer and the team are third in WSL 2, seven points behind leaders Doncaster Belles with a game in hand, as they head into a month’s break. Brighton already have a place in the restructured top tier of women’s football for the 2018/19 campaign and Buet feels progress is being made with every game played this season. She said: “We’re pleased with where we are but we still know we have a lot to learn. “Throughout the season, it was always going to be a lot of learning curves for us. We’ve played against some good teams and we’ve played against teams that have tested us in other ways, which we’ve come away from, anaylsed and tried to work on going forward. “There have been some ups and downs and some results that should have been better but as a whole the progression has shown in games. Albion beat Oxford 5-1 last Thursday but Buet, who has eight caps for England, says the team have learned more from their two league defeats this season – to Millwall and Doncaster – than their other games. She said: “We learned more from those two defeats than most of our other games this season, which I think is the most important thing. “As a group we don’t look at points so much. We look at performances and we were disappointed with our performance against Millwall when we lost and we were definitely disappointed with our performance against Donny – but Donny were the better team. “In that sense, we are disappointed we’ve dropped points against teams when we could have performed better but it is the way of the league. 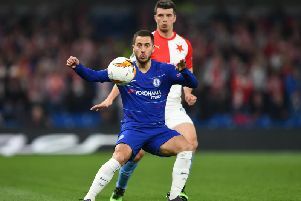 Brighton have also played top-tier sides Chelsea and Manchester City – who they will come up against in league action next season – in cup competitions and Buet felt those games were another learning curve for the side. She said: “A lot of the players hadn’t played against that level of quality before. “For a lot of the girls it was eye opening to see where we need to be for next season. “We played Chelsea back in October/ November time and we had a game plan, which was to frustrate them and for about 80 minutes we did that. “Unfortunately with the likes of Chelsea, their squad is massive and with their quality they brought on international players and they’re always going to change a game. “The performance was very pleasing and the performance against Manchester City was just as pleasing. “Again we had a game plan set out and for a young team with not much experience playing against that quality of players, we frustrated them. “We’ve shown teams we will be able to compete next season, albeit we will need to finish more of our chances but the fact we are creating chances is good.